Samsung Electronics announced that it will showcase four innovative Creative Lab (C-Lab) projects, delivering a broad spectrum of experiences via Virtual Reality (VR) and Augmented Reality (AR), two of the most significant current technology trends, at this year’s Mobile World Congress in Barcelona. The projects will be exhibited at 4 Years From Now (4YFN), a platform for startup businesses, with potential to exhibit at MWC four years from now, to present as well as connect and network with investors. Created in December 2012, C-Lab is an internal venture incubation program that encourages a creative corporate culture and nurtures innovative ideas from Samsung employees. The program supports the development of inventing ideas from all areas of the business. 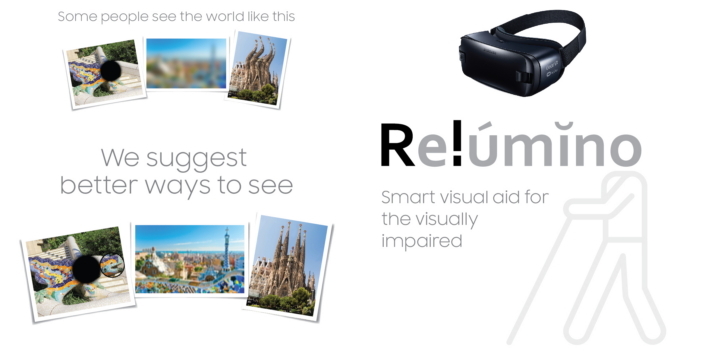 The products on display will include a smart aid for visually impaired people, monitorless PC viewing glasses, a VR home furnishing solution and a 360-degree travel experience platform. Monitorless is a remote-control VR/AR solution that enables consumers to use devices such as smartphones and PCs without a monitor. The solution consists of a special pair of glasses that resemble regular sunglasses. They are used to view content from other devices such as smartphones and PCs and can be used for both Augmented Reality (AR) and Virtual Reality functionality thanks to the electro chromic glass featured on the glasses. 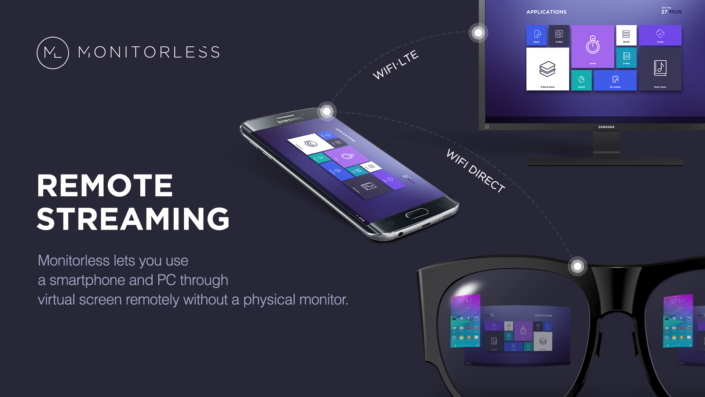 Monitorless addresses the fact that there isn’t enough AR and VR content currently available and also enables users to play high-capacity PC games on a mobile device. VuildUs is a home interior and furnishing solution enables users to see what a new furniture purchase would look like and whether it would fit in the room before they buy it. It consists of a 360-degree depth camera and a mobile app for VR compatible devices. First, users connect both devices and scan their home using the camera. That data is used to build a VR version of the user’s home which the user can then enter when wearing a VR headset. They can view items of furniture in 3D, and buy it on the spot if they like how it looks in the room. 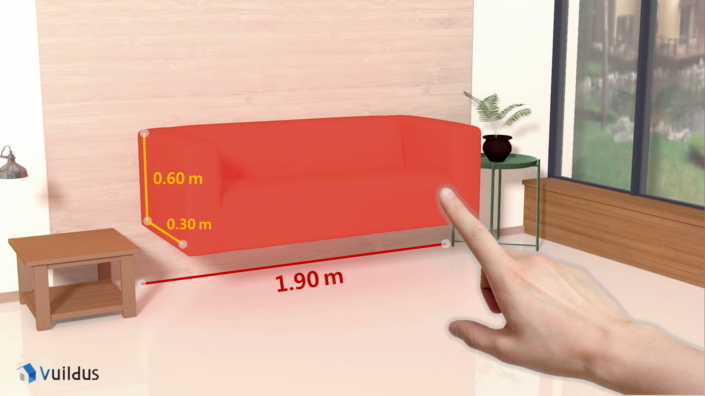 The solution removes the need for measuring space before buying furniture because it enables them to see whether it would fit in real time. 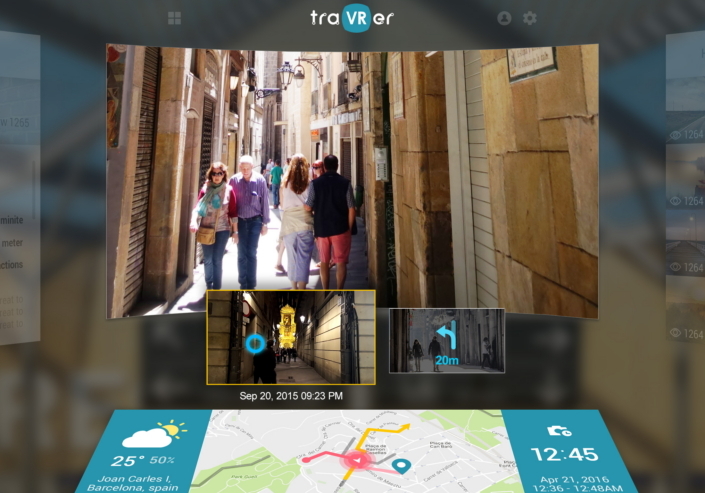 traVRer is a 360-degree video platform that enables users to experience realistic virtual travel before and after a real-life trip. Those using the platform are able to visit landmarks and famous places around the world but with the mood, noises and events captured. Users can switch seamlessly between different videos to go in different directions or see the place at a specific time of day – all without the need to navigate menus for alternative video options. The C-Lab projects will be exhibited at Samsung Electronics’ booth (4YFN G1 in the Fira Barcelona).